FlowTube can be used in a beneficial way in any Lean Manufacturing setting, from an assembly line to a medical environment. Due to it’s versatility FlowTube can be used to create equipment that is ideal for many Lean Manufacturing techniques and tools. Fast - FlowTube equipment is quick and easy to assemble. It requires no special tools and minimal training, this makes it ideal for management / Kaizen teams. Flexible - FlowTube equipment can be rapidly modified to improve ergonomics, add or remove features or change for different products. Unlike fabricated structures, which can be difficult or impossible to change without significant cost, FlowTube structures can be altered in minutes at minimal cost. Movable - All FlowTube equipment can be mounted on casters so that manufacturing cells can be quickly rearranged for optimal productivity. Even equipment not mounted on casters is relatively light compared to fabricated structures and should be movable without heavy equipment. Reusable - In the event that equipment must be completely redesigned, FlowTube structures can be easily disassembled and the components reused to create new equipment. Sort - As FlowTube structures are open and bespoke, this prevents the accumulation of unnecessary tools and consumables. Shine - FlowTube can be ordered in a variety of colours and finishes suitable for cleaning. It is also easy to partially disassemble structures if thorough cleaning is required. Set In Order - As FlowTube is custom built and easy to reconfigure, it can be designed to present the right tools and consumables, in the right place at the right time. Standardise - It is easy to standardise FlowTube equipment - even when improvements are made - as the structures are quick and easy to reconfigure. Sustain - Due to the open nature of FlowTube structures, it is very easy to conduct 5S audits to ensure that discipline is being sustained. As part of efforts to implement ‘pull’ systems and improve flow, one of the first steps is to implement Flow Racks (Supermarkets) to draw parts from. 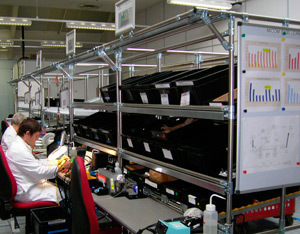 These Flow Racks (which can be known as Supermarkets) are normally FIFO [First In First Out] and allow easy picking of parts for replenishing production cells. Visual Management - As FlowTube structures are very open, it is easy to see inventory levels at a glance. Easy To Reconfigure - Once your FlowTube Flow Rack or Supermarket has been constructed, it can easily be reconfigured in a variety of ways. The angle of each shelf can be changed quickly to control the speed of material and can be customised with roller tracks. If batch sizes are reduced, the number of shelves and height between shelves can be changed. If the rack is no longer required, the components can be reused to create other FlowTube structures. Display Boards - FlowTube can be used to create cheap and flexible display boards. These can be used to display live production information, announcements and other bulletins. Colour-Coding - As FlowTube is available in a number of colours, equipment can be colour-coded both for it’s standard location within the production environment and to highlight non-standard conditions. Design For Visual Management - FlowTube structures can be specifically designed to enable visual management of inventory, production rate and highlight abnormal conditions. Reducing changeover time is critical to allow the reduction of batch sizes and accommodate greater product variety efficiently. FlowTube can be used to create custom carts and other structures that can be used to prepare tools and consumables in advance. As FlowTube structures are easy to modify, they can be updated as SMED activities progress.